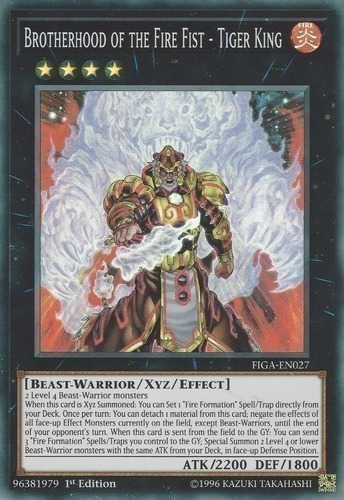 When this card is Xyz Summoned: You can Set 1 "Fire Formation" Spell/Trap Card directly from your Deck. Once per turn: You can detach 1 Xyz Material from this card; negate the effects of all face-up Effect Monsters currently on the field, except Beast-Warrior-Type, until the end of your opponent's turn. When this card is sent from the field to the Graveyard: You can send 3 "Fire Formation" Spell/Trap Cards you control to the Graveyard; Special Summon 2 Level 4 or lower Beast-Warrior-Type monsters with the same ATK from your Deck, in face-up Defense Position.